American Culture Has Become More Open, International, and Diverse. Trump’s Budget Would Reverse That. 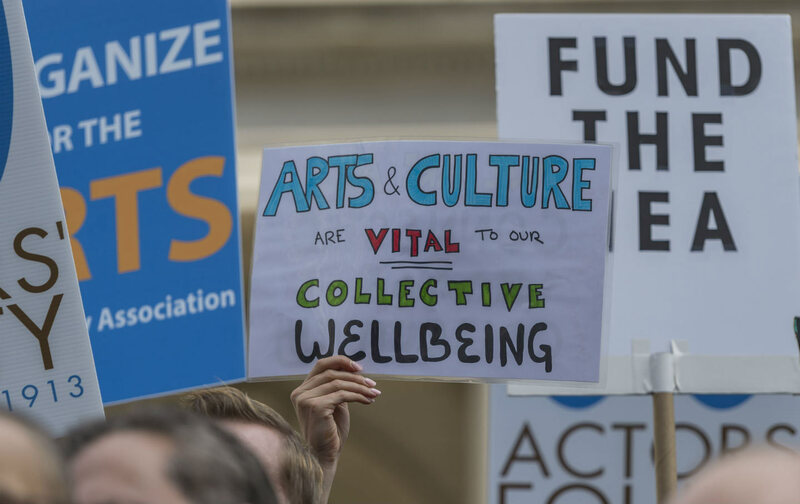 The budget would deal crippling blows to institutions in the arts and humanities and to organizations that foster understanding of global affairs and cultures. The Trump administration’s proposed 2018 budget, which prioritizes defense and national-security spending above all else, would deal crippling blows to government-funded institutions in the arts and humanities and leading American organizations that foster international dialogue and understanding of global affairs and cultures. Reversing decades of bipartisan political and financial support for such institutions, the Trump White House seems to view these programs with barely disguised disdain, as reflected in the justifications offered by the Office of Management and Budget. The underlying message is that, to survive, such organizations will have to rely on private funding. If the president gets his way in Congress, which is by no means certain at this point, the National Endowment for the Arts and the National Endowment for the Humanities would disappear from the federal budget over the next year, along with the Corporation for Public Broadcasting, the Woodrow Wilson International Center for Scholars, the United States Institute of Peace, and several foundations working in regions around the world of interest and importance to Americans. Some of the cuts fall under the combined budget of the State Department and United States Agency for International Development (USAID), which has been slashed by nearly a third, to $37.6 billion. Many other cuts affect freestanding agencies that are nevertheless reliant on government assistance. Also scheduled for elimination are educational and humanitarian programs in various other government departments, as well reductions for science research and the zeroing out of contributions for the Green Climate Fund and the Global Climate Changes Initiative, which had been budgeted for $1.6 billion 2017. The White House budget office lists 19 major federally budgeted programs being cut or eliminated, covering domestic as well as international policy and cross-cultural programs. Given the $600 billion-plus in discretionary spending allocated to defense (compared with $500 billion for everything else), the cuts in cultural and people-to-people international programs do not add up to significant savings for tightening a nationalistic, security-driven budget that Secretary of State Rex Tillerson described as having four major priorities: “defending US national security, asserting US leadership and influence, fostering opportunities for US economic interests and ensuring effectiveness and accountability to the US taxpayer.” The deadline for congressional action on the budget is September 30; the new US fiscal year begins on October 1. Budget cuts and elimination of programs, by the budget-makers’ own description, primarily serve the purpose of Trump’s America First agenda. Explanations or justifications for why these eliminations are being sought are contained in a chilling 171-page White House report titled “Major Savings and Reforms,” published along with the full federal budget on May 23. Typical of the explanations offered in the Major Savings and Reforms report is this one about the Wilson Center, a universally recognized venue in Washington, DC, for advanced research and the discussion of foreign policy and global issues. These cuts would have the effect of closing doors, especially for the young, to programs at home and abroad that not only enrich American life but also transcend the country’s borders. Such programs are also important to inform public opinion in the United States, where Islamophobia and right-wing vigilantism appear on the rise in tandem with the Trump attempts to bar as many Muslims as possible from the country. Non-Arabs and non-Muslims have been caught up in violence that recently has left innocent Indian citizens and Indian Americans dead or wounded at the hands of ignorant assailants. The National Endowment for the Arts, for example, has reached down to localities with grants that foster creative programs across the United States—from support for regional folk music and jazz to underwriting performances in theater and dance for under-served audiences in remote rural and poor urban communities—while showcasing American culture around the world. Separately, a similar program with a global reach, administered by the State Department’s cultural and educational exchanges, is also doomed. Using data in the Major Savings and Reforms report, a rough estimate below shows how much funding each program will lose—and the damage it could do. An exhaustive total of projected savings cannot be calculated until all affected government departments, freestanding federal agencies and scattered small programs can be accounted for and some figures are not consistent across all government documents. The Peace Corps, now sending volunteers to more than 50 countries—most recently adding Burma to the list—would drop to $398 million from a requested $410 million, which may seem modest. But it is the largest proposed budget cut to the program in four decades, and Glenn Blumhorst, president of the National Peace Corps Association, an alumni group, said in reacting to the cuts that the Peace Corps will also feel the impact of reductions in funding in State Department diplomacy and development programs, with which it has partnered. “This represents a step in the wrong direction,” he said. Independent government-funded agencies to be eliminated (but allocated small sums for expenses to close down): National Endowment for the Arts cut to $29 million from $148 million. National Endowment for the Humanities cut to $42 million from $148 million. The African Development Foundation, which works in partnership with Africans on the ground in programs to increase US presence in the hardest to reach areas of extreme poverty, would be cut to $8 million from $30 million. The Inter-American Foundation, which funds projects developed locally by grassroots groups, would be cut to $5 million from $22 million. US Institute of Peace cut to $19 million from $35 million. US Trade and Development Agency cut to $12 million from $60 million. Woodrow Wilson International Center for Scholars cut to $7 million from $11 million. Agriculture Department: McGovern-Dole International Food for Education program, which provides surplus American food crops and other donations to schools to promote both education and nutrition in poor communities especially for girls, would be eliminated to zero from $201 million. Education Department: International education and language programs cut to zero from $72 million. Cues from politicians can have negative effects that can be felt far outside the government, American history shows. In the 1950s, following the communist victory in China and the early stages of a cold war with Russia, anticommunist hysteria fanned by Senator Joseph McCarthy and the House Un-American Affairs Committee led to the loss of scholars and diplomats among the most knowledgeable on China. At the beginning of June, in the wake of President Trump’s disruptive trip to the region, in which he aligned the United States with Saudi Arabia and Israel against Iran, the Middle East Studies program at California State University, Fresno, coincidentally called off a plan to fill a professorial chair named in honor of the late Edward Said, a Palestinian-born scholar. People at the university told local media that pro-Israeli pressures arose when it was revealed that four short-listed candidates were all Arabs. The program in Fresno prided itself in being inter-disciplinary and multicultural, with language studies in Arabic, Armenian, Hebrew, and Persian. The Budget eliminates the International Education and Foreign Language Studies Domestic and Overseas Programs, which are designed to strengthen the capability and performance of American education in foreign languages and international studies. Other Federal Agencies whose primary mission is national security implement similar programs and are better equipped to support the objective of these programs. Under Trump, the White House is about the only public institution in America that remains all male, all white, and mostly all millionaires and billionaires. Culturally, too, the president, who exists on fast food and steak, seems to be taking America back to the 1950s, said Howard G. Goldberg, a former senior editor of The New York Times Op-Ed page and now a writer on wines and vineyards. That was the picture more than half a century ago. Since then young Americans, still often regarded abroad as ignorant of foreign places and people, have grown up with the benefits of the cultural institutions Trump’s budget has targeted. American society has changed profoundly in many ways. Stroll the campuses of leading colleges and universities, or visit US embassies around the world, and the pervasive diversity of the United States is evident. At home, this diversity extends to the theater, film, media, music, sports and fashion. The National Endowment for the Arts, founded in 1965 as an independent agency under the federal government, has funded a number of programs to expand American horizons over the past few years and hopes to continue making grants into 2018. One such project is Blue Star Museums, which provides free admission to over 2,000 museums across the country for active-duty military personnel and their families. The program is intended to provide “an opportunity to enjoy the nation’s cultural heritage and learn more about their community, especially after a military move.” Another ongoing project of the endowment, the Big Read, makes grants to nonprofit organizations in 32 states with shared reading sessions around 21 books chosen to bring “contemporary works to communities across the country, helping us better understand the diverse voices and perspectives that come with it.” Creative artists often still unknown, or even a little too wacky, for traditional donors, get financial boosts and encouragement from NEA grants delivered through local cultural organizations.